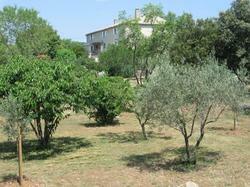 Gîte Le Mas de la Garrigue is 1 km from the centre of Les Vans and 2 km from the Païolive Forest. It offers a terrace with garden furniture and an outdoor swimming pool. Free Wi-Fi is available. The apartment includes one bedroom with stone walls, heating and a private bathroom with a bath. There is also a washing machine and a TV. A kitchen equipped with a dishwasher and a fridge is available at the property. A microwave is provided. Guests can practice canoeing and climbing 3 km away and the River Ardèche is 15 km from Gîte Le Mas de la Garrigue. Free private parking is available on site. This heated apartment offers stone walls, free Wi-Fi and a private bathroom with a bath.